Yum! That’s what we thought when we first saw this amazing dog-friendly pizza recipe! Using quality, healthy ingredients that are packed with solid nutritional value and amazing taste, this pizza is delish. Your pup just might be wanting pizza every night for dinner. Chow down! Preheat the oven to 400° F. Whisk together the coconut flour and dried herbs in a large bowl and set aside. In a separate bowl, whisk together the egg and sodium-free chicken broth. Use a wooden spoon to make a well in the center of the coconut flour mixture and pour the egg mixture inside. Stir well and form the dough into a ball. 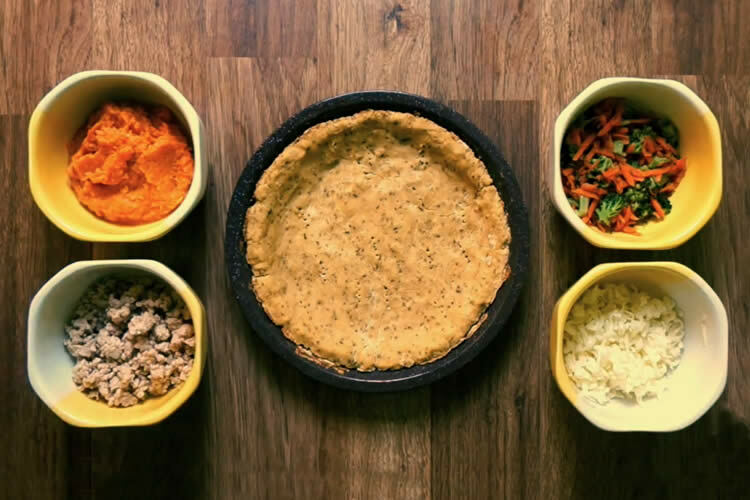 Press the crust evenly into a well-greased pie plate. Bake at 400° for about 18 minutes, or until the crust is browned. Let cool before adding the toppings. Spread a layer of mashed sweet potato onto the cooled crust—this will serve as your pizza sauce. Top evenly with pre-steamed carrots and broccoli*, followed by unseasoned cooked ground chicken, sausage treats (if using), and finally the grated low-fat mozzarella. The amount you use for each topping depends on the size and weight of your dog. (Consult your vet if you’re not sure how much of each ingredient is safe for your particular pup.) Put pizza under a broiler on high for approximately 3 minutes, or until the cheese is nice and melted. Let cool, then let the pooch pizza paw-ty begin! *Note: These pizza toppings are our own suggestions. You can choose your own dog-safe veggies and treats, though we recommend you use sodium-free (or low-sodium) ingredients.